This major 1-story addition to an existing hospital was the result of a new conceptual campus plan for a critical access hospital in Central Iowa. After exceeding the facility’s original capacity, the first step of the refreshed masterplan was the design of a new outpatient clinic, promoting a zoned healthcare campus. All outpatient services including primary care, therapy, rehabilitation, and wellness are consolidated in a state-of-the-art facility focused on quality of care. A unifying precept of the design was to deploy a formally simple diagram as a counterpoint to the existing facility. 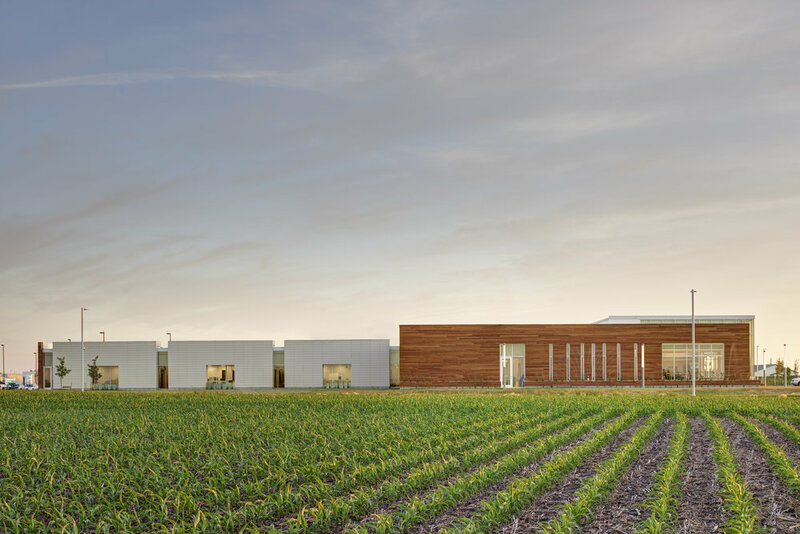 The wellness/therapy wing is clad in Ipé while the three clinic pods are identified by linen colored terracotta cladding, complementing the existing campus palette but providing a more progressive envelope design. A key component to the project is a new main entrance to the hospital, incorporating a new porte-cochère allowing covered cueing space for multiple vehicles. The new entry is framed by Ipé cladding and accented by glass which emanates light and serves as a beacon for the hospital and the community it serves. The team worked to incorporate large graphics strategically placed at patient destinations and corresponding routes through the addition to assist with wayfinding for the aging, rural patient demographic. The natural exterior materials are extrapolated into the interior through use of travertine tile and natural wood finishes creating a spa-like environment for patients and guests.